The Black ‘Obsession’ Tuxedo by Michael Kors is a modern fit tuxedo. Much like the ‘Desire’, the ‘Obsession also features a single-breasted two button front with notch lapels, but the lapels on the ‘Obsession’ are actually self material with a 3/8\” satin trim. It also features satin besom pockets, side vents, and is fashioned from the same luxuriously soft Super 130’s Venetian Wool. 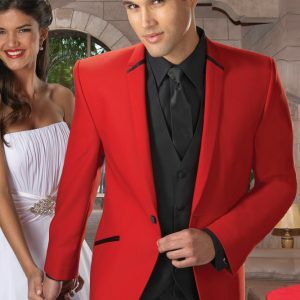 This tuxedo is guaranteed to have you looking suave and sophisticated, with or without a boat.